Louis Hector Berlioz was the son of a physician. He started studying music when he was twelve, but because his father didn't approve he never learned to play the piano. Instead he played the guitar, the flageolet and the flute. His first compositions were romantic like himself. In 1821 he went to Paris to study medicine, but he visited the opera and started studying at the library of the Conservatoire, where Cherubini tried to remove him because he was no formal student. But professor Jean-François Le Sueur supported him and in 1824 he broke off his medical studies. In 1826 he started studying composition under Le Sueur and Reicha at the Conservatoire. He failed to win the Prix de Rome several times until he won it in 1830. In the same year he composed his "Symphonie fantastique" and it was first performed on 5 Dec 1830 in Paris. He started a relationship with the pianist Maria Moke and they became engaged. He left for Rome on 30 Dec 1831. There he received a letter from Maria's mother that the engagement was off and Maria would marry Camille Pleyel instead. He decided to kill the three of them, stole a pair of pistols and left for Paris. When he arrived in Nice he realised the stupidy of his plan and returned to Rome. After his return in Paris in 1833 he started a relationship with the singer Harriet Smithson. Allthough he spoke no English and she spoke no French they married on 3 Oct 1833 with Liszt as one of the witnesses. On 14 aug 1834 they had a son, Louis. His opera "Benvenuto Cellini" failed in 1836. Because succes in France came hard he travelled to Germany, Austria, England and Russia where he conducted operas. In 1844 he separated from Harriet and in 1846 his opera "La damnation de Faust" was another failure, allthough it was highly acclaimed in later times. In 1850 he became head librarian at the Conservatoire in Paris and this supplied him with a steady income. In 1854 Harriet died and in October he married his mistress Maria Recio. In 1856 he went to Weimar to attend a performance of "Benvenuto Cellini" conducted by Liszt. Liszt was schocked to learn that Berlioz didn't appreciate the music of Richard Wagner at all. The Princess Sayn-Wittgenstein advised him to compose a new opera and this would become "Les Troyens". He composed it between 1856 and 1858 but never saw it performed in its entirety during his lifetime. His wife suddenly died in 1862, aged 48. 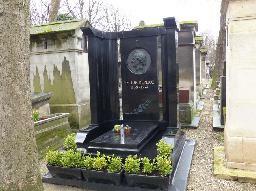 At Montmartre cemetery he met a young woman named Amélie and a close relationship developed between them. To his regret she ended the relationship in February, 1863. Early in 1864 Harriet Smithson's he was present at the opening of Harriet's grave. Her remains were transferred to Montmarte because the Saint-Vincent cemetery was to be demolished. Later in 1864 he received the Légion d'honneur. In August of that year he heard that Amélie had died. He discovered her grave when he walked at Montmartre cemetery and she was dead for six months at that time. In 1866 he met Liszt for the last time. In 1868 he performed in Saint Petersburg, but he was exhausted when he returned. In 1869 he died at his home in Paris. The grave of Hector Berlioz at the Cimetière Montmartre, Paris.